“The American people, from their earliest days, have observed the wise custom of acknowledging each year the bounty with which divine Providence has favored them. In the beginnings, this acknowledgment was a voluntary return of thanks by the community for the fruitfulness of the harvest. Though our mode of life has greatly changed, this custom has always survived. It has made thanksgiving day not only one of the oldest but one of the most characteristic observances of our country. On that day, in home and church, in family and in public gatherings, the whole nation has for generations paid the tribute due from grateful hearts for blessings bestowed. “To center our thought in this way upon the favor which we have been shown has been altogether wise and desirable. It has given opportunity justly to balance the good and the evil which we have experienced. In that we have never failed to find reasons for being grateful to God for a generous preponderance of the good. Even in the least propitious times, a broad contemplation of our whole position has never failed to disclose overwhelming reasons for thankfulness. Thus viewing our situation, we have found warrant for a more hopeful and confident attitude toward the future. “In this current year, we now approach the time which has been accepted by custom as most fitting for the calm survey of our estate and the return of thanks. We shall the more keenly realize our good fortune, if we will, in deep sincerity, give to it due thought, and more especially, if we will compare it with that of any other community in the world. “The year has brought to our people two tragic experiences which have deeply affected them. One was the death of our beloved President Harding, which has been mourned wherever there is a realization of the worth of high ideals, noble purpose and unselfish service carried even to the end of supreme sacrifice. His loss recalled the nation to a less captious and more charitable attitude. It sobered the whole thought of the country. A little later came the unparalleled disaster to the friendly people of Japan. This called forth from the people of the United States a demonstration of deep and humane feeling. It was wrought into the substance of good works. It created new evidences of our international friendship, which is a guarantee of world peace. It replenished the charitable impulse of the country. “We have been blessed with much of material prosperity. We shall be better able to appreciate it if we remember the privations others have suffered, and we shall be the more worthy of it if we use it for their relief. We will do well then to render thanks for the good that has come to us, and show by our actions that we have become stronger, wiser, and truer by the chastenings which have been imposed upon us. We will thus prepare ourselves for the part we must take in a world which forever needs the full measure of service. We have been a most favored people. We ought to be a most generous people. We have been a most blessed people. We ought to be a most thankful people. “Wherefore, I, Calvin Coolidge, President of the United States, do hereby fix and designate Thursday, the twenty-ninth day of November, as Thanksgiving Day, and recommend its general observance throughout the land. It is urged that the people, gathering in their homes and their usual places of worship, give expression to their gratitude for the benefits and blessings that a gracious Providence has bestowed upon them, and seek the guidance of Almighty God, that they may deserve a continuance of His favor. “In Witness Whereof, I have hereunto set my hand and caused the seal of the United States to be affixed. 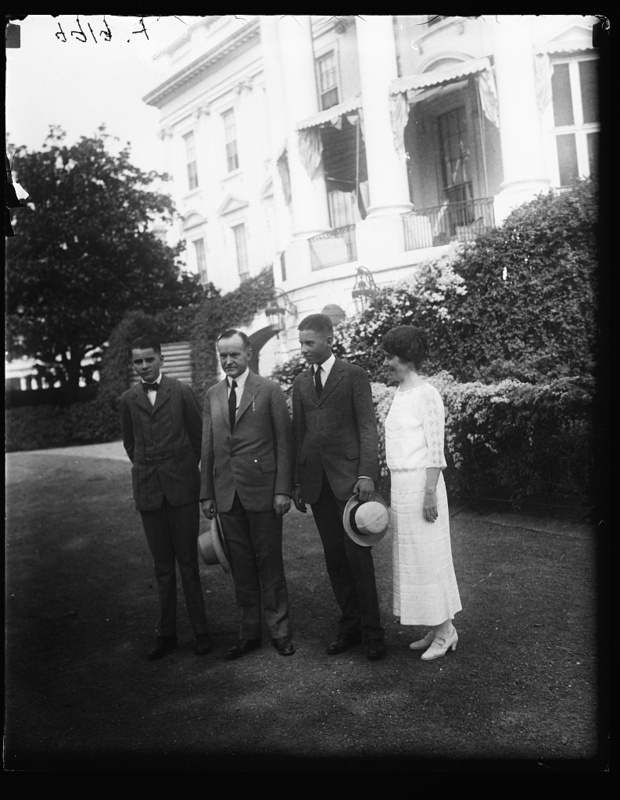 The Coolidge Family walking the grounds of the White House, August 1923. 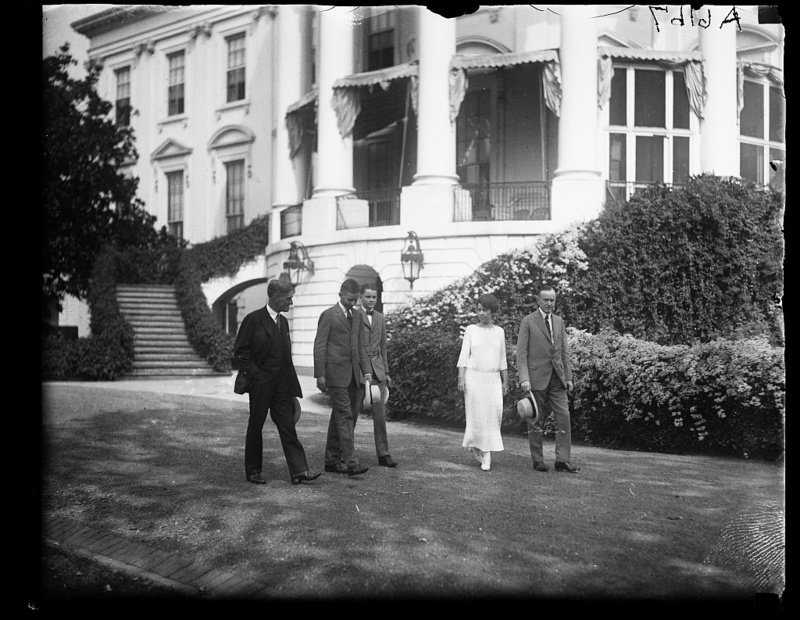 In the picture below, the man to the left is Mr. Christian, the secretary of the late President Harding. Courtesy of the Library of Congress. Coolidge’s Thanksgiving Proclamation 1680, shared with you last year remains equally as timely in 2014. It can be found in Richardson’s Supplement to the Messages and Papers of the Presidents, pp. 9326-9328.